I have long ago decided that if I ever opened up a service industry based business that I would offer a discount to people who open carry (or concealed carriers who can prove it) when they patron my establishment. 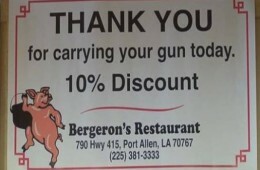 The owner of a popular Louisiana restaurant began giving customers a 10% discount off the cost of their meals providing they can prove they’re carrying a firearm. Liberals are not amused. Bergeron’s Restaurant owner Kevin Cox is bucking the trend of such chains as Chili’s, Sonic, and Chipotle, which now are “gun-free zones,” by actually encouraging patrons to carry when frequenting his Port Allen eatery. Cox had already been offering the discount to police officers, and then thought, why not do the same for lawful gun owners. I keep hearing so much about people banning guns. Target’s banning guns and these people are banning guns. Don’t they realize that that’s where people with guns are going to go? I want to take the opposite approach. How can I make my place safer? I’ll tell you what, next time I find myself in Louisiana hankering for some Cajun Cajun BBQ I’m driving right by all the places that hate on my right to protect myself and heading to Bergeron’s Restaurant. Not only do they respect he rights of Americans but also will give you a 10% discount for exercising them. Let the big national chains kow tow to the elitist billionaire gun control crowd. It’s about time we started heading back to the small local mom and pop stores anyways. Seriously…when was the last time you RAVED about a meal at Chili’s?